CIMC provides employment and training services and other related services to Indian and Native American people who live in our service area which includes a large part of California, Illinois and three counties in Iowa. 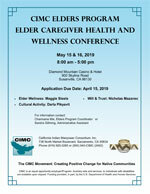 May 15-16, 2019 - CIMC Elders Caregiver Health and Wellness Conference - Diamond Mountain Casino & Hotel, 900 Skyline Road, Susanville, California - Apply Today! For more information about CIMC events, visit CIMC Upcoming Events Calendar. As first Americans, we walk in the present with our eyes on the future and the past in our hearts. We advocate pride in our cultural integrity. We honor the spirit that ensures continuity of the sacred circle.